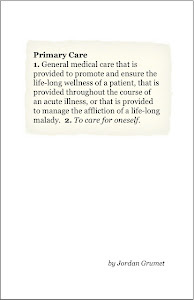 A primary care physician's thoughts on medicine and life. It was a little game we played. My shoes squeaked quietly down the hallway of the nursing home as I approached her room. I knocked gently trying to avoid any particular rhythm or dissonance. Her voice was at once stern, and then followed by peels of laughter. She only saved such greetings for me. And I tried to trip her up. I varied my visits by time and pattern. Sometimes I knocked, and others I would call out in a distorted voice. She always knew. She was recovering quickly and would be discharged soon. The rest of my visits that day were not as positive. The gentleman next door was concerned with service issues. He decried the quality of the food, and demanded a faster response to his call light. I didn't have the heart to explain that as the physician, I had little control over these issues. The woman on the floor above was dying a slow, uncivilized death due to Alzheimer's. I huddled with her family, and discussed the gruesome details. Her body was fading away much in the same way as her mind. She lost every ounce of extra weight. Her voice had diminished to a nonsensical whisper. She was no longer capable of making the difficult decisions that were left to her befuddled family. They signed the necessary paperwork with both hope and sadness. Hope that the end would ultimately be dignified, and sadness that her time was indeed near. Cancer is an ugly term. But it was chemotherapy that sickened the young man at the end of the hall. He spent a week in the nursing home between hospitalizations. His family couldn't manage the vomiting and intravenous fluids. He peered through the window at the first ray of sunlight on a cold winter's day. He didn't feel much like talking. I left the facility two hours after stepping foot into the front atrium. I felt as if I had already been working a full day. But there was a certain lightness nonetheless. Because just before leaving, I crept up to her door, knocked yet one more time, and waited gleefully. I paused for a moment and then joyously replied. I could hear her laughter echo past me and through the hallway as I exited the building. "But there was a certain lightness nonetheless." Delightful and beautifully written. For some reason, this sweet story reminded me of Claude Debussy's quote that "Music is the space between the notes." Your comments are eyeopening and from my end explain many of the medical groups ongoing actions when we meet. There is a concern I am sure of possible litigation over every visit but then that was true when I was a financial manager. No decision we made at any level is without its risks, your profession being the most risky. There is a reason; many medical folks in the past I have encountered had an attitude of perfection, especially surgeons. Much of that has changed with the realization of your postings that fixing anything, humans included, can and does fail often but has a significant amount of success. Continue to follow the philosophy that you espouse and your path should be smooth. Humility and kindness are the best medicines that any profession can have. 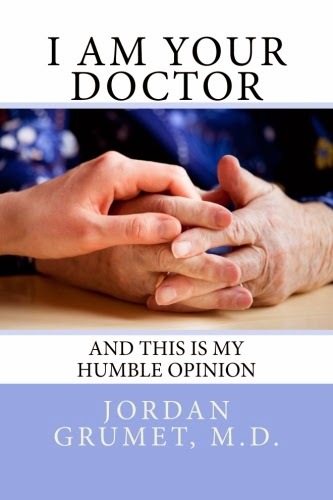 Jordan is an Internal Medicine physician practicing in Northbrook, Illinois. Empathy: Are We Asking For Too Much?